← King, John R. The Shadow of Reichenbach Falls. New York: Forge, 2008. It’s hard to see the powder burns on this chart. But they’re there. Oh, yes, they’re there. Silence matched me stride for stride. “I have been. Of course I have. There are many scars there for so thin a hand. 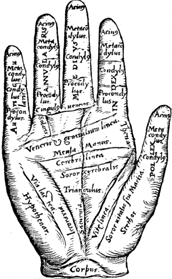 The palm has tobacco burns, the sort that would come from embers falling from a pipe, and acid burns from mixing caustic chemicals. The back of the hand has black powder scars from firing a gun, and here—do you see these?” He rolled back his sleeve and showed me the purple depression of veins leading from his inner elbow. “More likely, cocaine. These are recent scars” (75-6). I am originally from Southwestern Pennsylvania – you know, farm country. The kind of place where the first day of hunting season is a mandatory day off from school, where you yield to passing tractors, and where my mother was actually able to have milk delivered (complete with a delivery person in a white uniform) until I was in college. No one in my neighborhood locked their doors, I learned to ride a horse before I learned to drive a car, and you can feel free to fill in the rest of the stereotype however you see fit. You’d probably be right. I am also the daughter of an immigrant. My father came to the United States when he was 25-years-old, complete with his own set of European values – and distinctly European tastes. I can guarantee that I was the only child in my fifth grade class that had ever eaten goose liver pâté (or had eaten goose at all, come to that – in fairness, I still have never eaten venison). My sister and I were the only children in our neighborhood that knew how to pronounce Camembert correctly (our father was into cheese before cheese was cool). And I know was I was the only 10-year-old who went to see a German opera for her birthday (and this was a few years before I learned how “introspective” German music can be). So, I’m used to having strange tastes. I’m used to liking things that no one else likes. And so, several years ago when I finished reading The Shadow of Reichenbach Falls, by John R. King (also known as J. Robert King) I fully expected to be one of a very exclusive minority that enjoyed this book. I anticipated it. I did not, however, expect to feel like the only person on the planet that enjoyed this book. And now, several years and one rather pleading (I see in hindsight) book review later, I find that this is still the case. If King’s book only has a fan club of one, then I’m the one attending the meetings, and I serve a superb Scotch. Look, I get it. I can see and observe when the mood strikes me. There’s a lot about King’s novel that should surely leave a very sour taste in any Sherlockian’s mouth, especially a traditional one. Thomas Carnacki – who’s that and why is he narrating? A lengthy interruption from the main narrative in the form of a memoir? No, thanks. Perhaps the worst offense of all, Professor Moriarty as a sympathetic and – dare I even say it? – romantic hero (at least for a short while)? Check, please. And demons? Here, I poured you a scotch. Drink up. Holmes will get it for you. It’s from Watson’s special stash. But for those who read Sherlockian pastiche not just for a traditional mystery, but for a character study, for insight to the mind and manner of the Great Detective, then this novel has so much to recommend. For what is Sherlock Holmes without his great mind? Is he even Sherlock Holmes at all? King’s amnesiac-Holmes is his interpretation of the man laid bare, with all his structure and building-blocks exposed. And there are very believable and realistic glimpses of why Holmes is as he is. A Detective without his memory is in many ways very much like himself, as the passage quoted above indicates. But he is also in some ways very childlike, unable to ascertain how he accomplishes certain things. At times he seems equally confused and terrified by his abilities, and at others, amused by them. 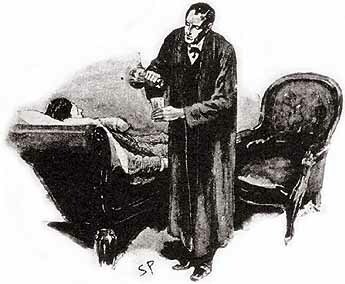 He seems disproportionately trusting, more dependent on others, and more aware of his physical needs than he would be with his memory intact (in fact, when Silence/Holmes expresses hunger and a desire for food, it is almost shocking, disorienting, and removed me from the story more than any demon ever could). “Yes. That is the problem. This brain of yours. Empty. It’s not what I paid for. It’s the attic without the treasure… It’s as if the library of Alexandria had burned! […] It did burn, my friend. That library, with all the wisdom of the ancient world—that goddamned library is gone. Gone! And your goddamned mind is gone, too. All that you knew, all that you were—gone, except this pathetic, festering hunk of meat… (117). “And there is a listener beside me. He is a stocky man with an intelligent face and sensitive eyes…I look upon this slumping figure, who takes in my violin playing as a drunkard takes in gin, and I see greatness in him. Greatness and friendship” (90). This is all King’s interpretation, of course, but The Shadow of Reichenbach Falls is an excellent read for anyone who has ever chased the answer to the ever elusive question of Holmes’s essential nature. Stripped of nearly everything that distinctly characterizes him, Harold Silence/Sherlock Holmes makes for an interesting personality study, but barring that and underneath it all, Sherlock Holmes is still, even when Thomas Carnacki has to remind him (and he does have to remind him), a great man. Would you still like a Scotch? The Shadow of Reichenbach Falls is available from Amazon in hardback and Kindle editions, and from Barnes and Noble, for the Nook only. You can also find it at Powell’s and from ABE Books.